ADAM STERN has been leading the Seattle Philharmonic Orchestra since 2003. During his tenure he has brought numerous world, U.S., West Coast and Northwest premieres to the Puget Sound community. Stern’s unique programming combines beloved masterworks with must-hear rarities; his programs are not merely concerts, but true musical events. In September 2015 came word of two new appointments for Stern: Music Director of the Sammamish Symphony, and Assistant Conductor/Visiting "Pops" Conductor of the Oregon Coast Music Festival for the summer of 2016. Following Stern's OCMF debut, he was immediately promoted to Associate Conductor and permanent "Pops" conductor of the Festival. Stern was born in Hollywood in 1955. He began his musical studies at age five as a piano student, and began flute lessons two years later. At 15, Stern was accepted at California Institute of the Arts, where he initially majored in flute performance, but changed his major to conducting in his second year at the urging of the late Gerhard Samuel, a noted conductor and educator. Stern was graduated in 1977 with an MFA in conducting at 21, the youngest Masters degree recipient in CalArts’ history. ​He has since put that degree to good use, and has been a guest-conductor with the Milwaukee Symphony, the Rochester Philharmonic, the Boulder Philharmonic, the Chamber Music Society of Lincoln Center, the Symphonic Wind Ensemble at Michigan State University, the Sacramento Symphony, Chamber Music Northwest in Portland and the New York Chamber Symphony. ​Stern served as Associate Conductor of the Seattle Symphony from 1996 to 2001 and as Assistant Conductor from 1992 to 1996, conducting in all of the Symphony’s major concert series. He led the Seattle Symphony premieres of Vaughan Williams’ Symphony No. 3 and Elgar’s Symphony No. 2. In addition to conducting numerous classical concerts, Stern also made several ventures into the “pops” field, collaborating with such artists as James Taylor, Judy Collins, Art Garfunkel, Doc Severinsen and Frank Sinatra Jr.
﻿Stern was also Music Director and Conductor of the Northwest Chamber Orchestra from 1994 to 2000, leading the orchestra in six of the most successful seasons in its history. The Port Angeles (WA) Symphony, which played under Stern's music directorship from 2005 until 2014, also enjoyed a mixture of tradition and innovation as well as a widely-acknowledged and -acclaimed rise in its musical standards. ​As a composer, Stern has written for the concert hall and the stage. His official Opus 1, Dance Variations, was a prize-winning entry at the Delius Composition Competition in 1978. He has composed incidental music for productions of A Midsummer Night’s Dream, King Lear, The Winter’s Tale, Waiting for the Parade and Sweet Eros. His score for Richard III earned him a Los Angeles Dramalogue Award for Best Original Score. In Seattle, Stern wrote the music for Seattle Repertory Theatre's production of Art, as well as four works for Seattle’s A Contemporary Theatre: incidental scores for The Red and the Black, Alki, The Pillowman and A Christmas Carol, the latter score used every year since its 1996 premiere. Stern’s most recent composition for the concert hall is Spirits of the Dead, a setting for narrator and orchestra of the poem by Edgar Allan Poe, written for the opening concert of the Seattle Philharmonic's 2014-15 season. Stern is an active and acclaimed pianist. As a soloist, he has been heard with the Seattle Symphony, Seattle Philharmonic, Northwest Chamber Orchestra, Rainer Symphony and Port Angeles Symphony in concertos by Bach, Mozart, Haydn, Beethoven and Gershwin. He has also been featured as a chamber musician in Seattle and at the Orcas Island Chamber Music Festival, in a wide range of works from Mozart, Beethoven and Schubert to Ravel, Frank Martin, Copland, Gail Kubik and Ysaÿe. ​An award-winning recording producer, Stern earned a Grammy as Classical Producer of the Year, principally for his recordings with Gerard Schwarz and the Seattle Symphony. ﻿​Stern is also an enthusiastic and indefatigable music educator. From 2008 to 2015 he was an Adjunct Faculty member at Cornish College of the Arts, where he taught composition, conducting, film music history and orchestral studies; he also conducted workshop productions of Puccini's Suor Angelica and Menotti's The Old Maid and the Thief. 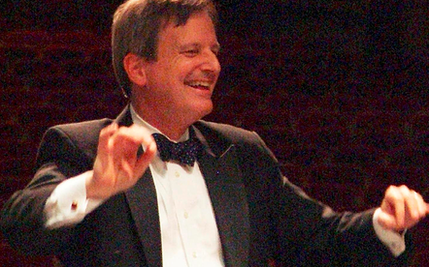 He was the conductor of the orchestra at the Seattle Center Academy from 1993 until its final year (2008). From 2001 until 2009 he was Director of Instrumental Music at the Lakeside Upper School, where he introduced students to an unprecedented variety of music, from pre-Baroque to the late 20th century. He has also taught film music history at the Seattle Film Institute. Stern is presently teaching an enthusiastic clutch of piano students at the Ballard Academy of Music and Dance. ​Venturing even further outside the mainstream classical world, Stern worked for two years as a music copyist for Frank Zappa, and appeared in the Richard Dreyfuss film “The Competition” as (to quote Pauline Kael's concise and accurate description of his pianist character) "robotic prune" Mark Landau. Thus bitten by the acting bug, Stern has occasionally appeared as speaker with orchestras and ensembles, including the parts of The Narrator in Stravinsky's ​L'Histoire du Soldat ​and the Reciter in William Walton's Façade (the latter conducted by James Paul), both at the Orcas Island Chamber Music Festival, and The Narrator in Britten's The Young Person's Guide to the Orchestra with the Seattle Symphony under Gerard Schwarz.